This project was a bit of a failure considering what we had intended to create, but evolved into some great pumpkin sensory play instead! My daughter has recently been placed on a gluten free diet so our whole house has been cleaned out of all things gluten. 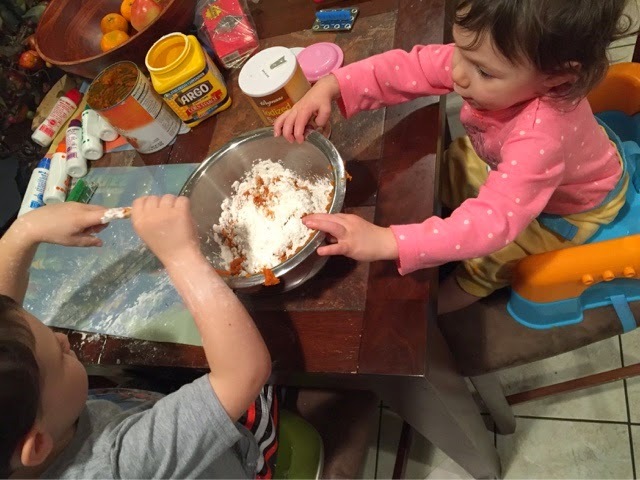 I hadn’t even considered all of our play dough recipes when tossing the bag of flour!! 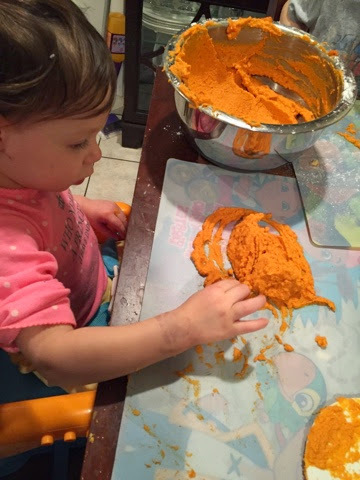 I set out to make pumpkin pie playdough today (the obvious failure) when it hit me that I didn’t have flour!!!! YIKES! I decided that it was better we learn to make gluten free playdough just in case Ava’s floury hands make it to her mouth…it would be a shame that with the hundreds of dollars I just spent on gluten free breads, pastas, pizza dough, bagels, pretzels (the list goes on) that her little belly got upset from licking a salty playdough finger! After quickly browsing Pinterest (my lifesaver/sanity-saver) I read through a few GF recipes and decided to try a combination of cornstarch, canned pumpkin and salt along with some pumpkin pie spice for scent. 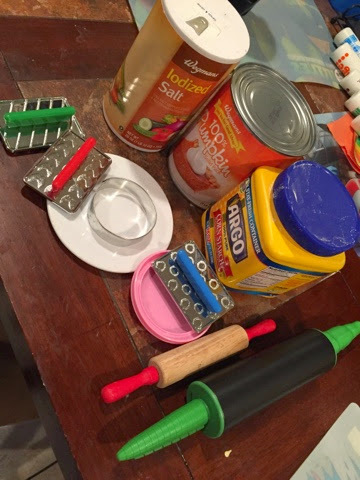 Our rolling pins and stampers were intended for playdough but also worked with the goo. So, I think this combination would have been fine had I not GREATLY underestimated just how watery the pumpkin is! 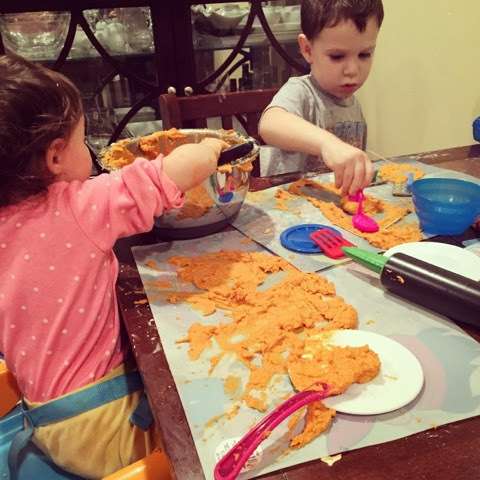 I’ve made so many loaves of pumpkin bread in the last ten years, you think I would have noticed that…after using all of the cornstarch I had, we were left with a thick pumpkin goo and nothing near a playdough…my advice? 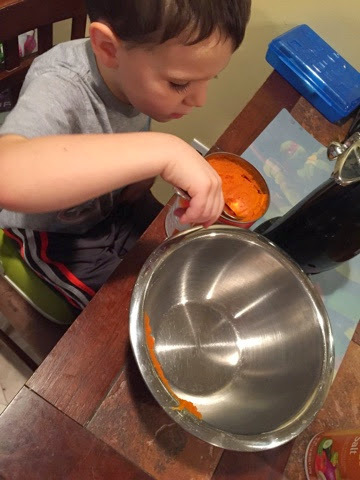 Pour the cornstarch and salt first then add the pumpkin in until it’s the right consistency, lesson learned. 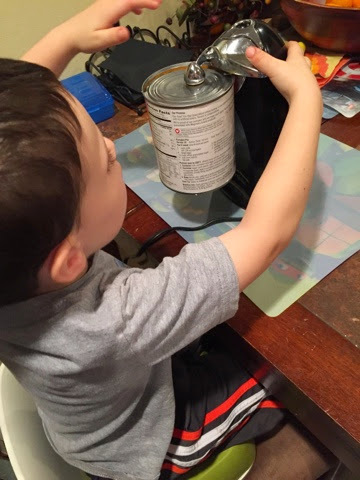 At the very least, the kids got their scooping/stirring practice…just not the measuring. 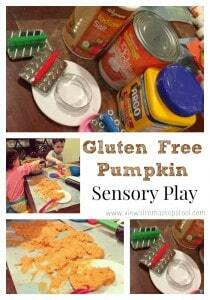 While it wasn’t playdough, it was fantastic sensory play! It had a fun texture and the scent of nutmeg and cinnamon, and we could mold it into mounds much like very wet sand at the beach. The kids played for quite some time, and although this made a big mess, the dogs didn’t mind helping with the cleanup on the floor.